The 2013 FEI European Pony Championships were held from Tuesday 23rd to Sunday 28th July in Arezzo, Italy. The Championships consists of the FEI European Pony Dressage, Eventing and Jumping Championships and GB sends teams to compete in each of the disciplines. Reports on the build up to the Championships can be found below with news of team contenders, selection trials through to updates during the event as the action happens. Very sadly, Gigolo (Going East x Nordcap) & Beth Horobin will no longer travel to Italy to be part of the dressage team due to veterinary issues. Our commiserations to Beth and her family and we hope that Gigolo is back to normal soon. The ponies have departed today on the 3 day journey to Italy along with the Eventing ponies. The riders, trainers and supporters will fly out later so they are there for the ponies' arrival. The Championships website has given some details of the XC course being built for the event. The course designer is Francesco Finocchiaro, an Italian who is accredited by the FEI to build International 3*/4* courses. The course will be a little under 4KM and although the site is naturally flat, they have altered the terrain in a number of areas to place jumps on a slope and create a lake. Part of the course will also run through the main grass jumping arena where they already have a small lake, devil's dyke and a bank. 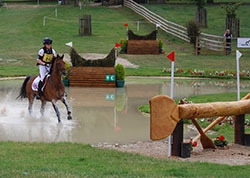 There will be a total of 3 different water jumps in the course - two on the main course and one in the arena. Francesco says "In building the course I also created a number of spectacular jumps such as the “Broken Bridge” and some based on size, also using ditches so as to emphasize not only technical expertise but also the determination of ponies and riders". Some of the XC jumps have been built on site with others coming from France. A test event was held at the end of June. British Eventing have announced the squad of 6 ponies and their riders who will travel to Arezzo where 4 ponies and riders will form the team and the remaining two will compete as individuals. The squad contains some very experienced ponies, albeit some now have different riders. Carrowmore Gemstone won Team & Individual Silver medals in 2012 (with Louisa Nesbitt). Catherston Nutsafe (a British-bred Elite graded SPSS mare) won Team Silver in 2008 & 2009 (ridden by Ella McEwen) and Team Gold in 2010 (ridden by Sam Ecroyd). Three Wells Breeze won Team Bronze & Individual Silver in 2011 (ridden by Sam Ecroyd) and Team Silver with her current rider in 2012. Then Craig Mor Tom (in 2012) and Killacoran Blue (in 2011) with their current riders have both represented GB as individuals at the Pony Euros. 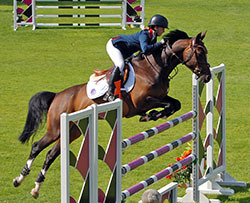 The Organising Committee and Italian Federation for Equestrian Sports have announced that 17 countries have confirmed their participation in the 2013 Pony European Championships. They list the participating countries as: Belgium, Denmark, France, Germany, Great Britain, Hungary, Ireland, Italy, Luxemburg, Norway, Poland, Russia, Spain, Sweden, Switzerland, The Czech Republic and The Netherlands. The final Jumping Pony Trials took place at the British Masters, held at South View Equestrian Centre from 5-7 Jul. Peter Gillespie was the Course Designer. The first pony class was a 1m25 Open and there were 22 starters. The winners were Christie Pritchard and Irish-bred Ruby Riot and Christie also took 4th place with another Irish-bred pony, Kilcloghan DG Clover. 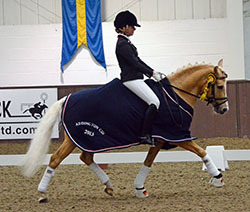 The second pony class, the European Viewing Trial, again had 22 starters and was won by Millie Allen with the Dutch-bred part-bred Arab, Scoubidou IV. Emily Ward and 8 year old King Mac were second with Alex Gill and British-bred Ammanvalley Santino third. The final pony class was the Fairfax Winter JA Classic/Viewing Trials and, of the 20 ponies competing, just six were clear in the first round, In the jump off only two combinations managed a double clear and the fastest was Millie Allen and her 2012 double Gold partner, Song Girl. More than 2 seconds slower for second place was Millie's 2012 team mate, Amy Inglis with French-bred Lea du Genier. Faye Adams & Some Like It Hot (who competed at the 2012 Pony Euros with Faye's sister Beth), were 3rd as the fastest with four faults. Barbury International Horse Trials was the venue for the final eventing selection event, a special Open Novice class that was only contested by the 9 long-listed ponies and their riders. As can been seen from the table below, it was a tightly fought contest and must leave the selectors with some thinking to do before they select the 6 riders to go to Italy. The winners were Yasmin Ingham & Craig Mor Tom. Individuals at the 2012 Pony Euros, Yasmin & Tom are the 2013 National Pony Champions as well as winning and placing second in two of the Trials, they must be strong contenders for a team place. British Showjumping sent a team and individuals to the Future Champions show in Hagen Germany from 11th-16th June and there were 6 pony classes. The first class, a 1m25 one round class was split in to 2 sections and both were won by British riders with fast clear rounds. The first was won by Emily Ward & Wizard VIII (breeding unknown) and the second by Faye Adams & Cisco Bay II (breeding unknown). Also clear but slower were Harry Charles & Moneymaker (breeding unknown), Christie Pritchard & Ruby Riot (Olympic Lux x not recorded), Emily Ward & King Mac (breeding unkn won), Emma Shingles & Tequila Twist (breeding unknown), Graham Babse & Wischin Chin M (CHin Chin x Cash), Alex Gill and British-bred Ammanvalley Santino (Cruglwyd Sant x unknown), Faye Adams & Some Like It Hot 3 (Breeding unknown). The second pony class was a 2 phase competition at 1m25 and Faye Adams & Cisco Bay II were second with a double clear in a slightly slower time that the winners Susan Fitzpatrick (IRL) & Petrus Spartacus. Christie Pritchard & Ruby Riot were also double clear. In the third pony class, one round over 1m30, Harry Charles & Moneymaker won with Emma Shingles & Tequila Twist 2nd. The 1m30 Pony Nations Cup was a tense competition. At the half way point, GB lead with zero faults as Faye Adams & Some Like It Hot 3, Christie Pritchard & Kilcloghan DG Clover (Condios Clover & Clover Hill) & Emily Ward & King Mac all going clear (Alex Gill & Ammanvalley Santino had just 4 faults). However, Germany were right behind with one time fault, then Ireland & France both with a total of 2 time faults. The top 6 teams went forward to the second round and clear rounds from the first two German riders put the pressure on the British team. All four did go clear in this round - however, both Alex Gill and Christie Pritchard had one time fault, giving Germany, whose 3rd rider had picked up one time fault themselves, chance to win if Emily Ward had any faults and their last rider went clear. Five faults for the last German rider still meant that Emily needed to go clear for GB to win outright as if she'd had any faults there would have been a jump off with Germany. 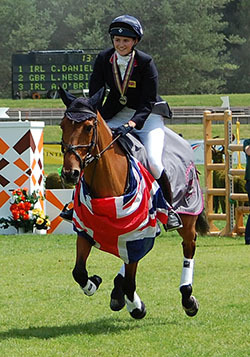 Emily & King Mac kept their cool and delivered the necessary clear in the time and GB won Nations Cup Gold. The next day was a rest day for the Nations Cup ponies with the only pony class being a 1m25 2 phase competition for ponies & riders that did not compete in the Nations Cup. This was won by Faye Adams & Cisco Bay II, who relegated Susan Fitzpatrick (IRL) & Petrus Spartacus to 2nd this time. Christie Pritchard & Ruby Riot were 4th with a slower double clear and Emily Ward & Wizard III were 9th (also with a double clear). So overall, GB riders and their ponies won the team competition and all bar one of the individual classes (and in that one a British rider was second). Fantastic results that will be giving the selectors plenty to think about and maybe some difficult decisions to make when picking the Pony Euros team in a few weeks, as there are some strong combinations who didn't travel to Hagen (like last year's double Gold winners, Millie Allen & Song Girl). 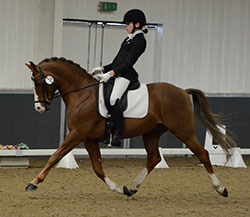 The last of the planned Dressage Trials took place on the 9th June at Wellington Premier League. The judges were Paco Guerra (at C) and Linda Whetstone (at B). All the top ponies competed and the results went much as recent form would have suggested, with the 2013 star combination of Phoebe Peters & the Danish born SL Lucci winning by a 4% margin. Phoebe, who is still only 13, also won the Junior Team Test on a mare that she's only been riding for a few months. Runners up were Phoebe's team mates in 2012, Erin Williams and Dynasty. 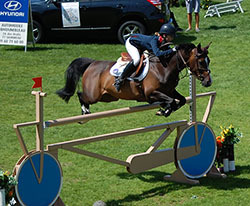 In her last year of eligibility for the Pony Team, Erin had also campaigned a mare in Juniors, Fleurie, but she sustained a minor injury so Erin decided to focus on the Pony Team for her final year. Third place went to Bethany-Rose Horobin & Gigolo who also scored over 70%. Gigolo represented GB at the was on the 2009 & 2010 Pony Euros teams with his previous rider Claire Gallimore, with Bethany-Rose, they were the reserves in both 2011 & 2012. This year though, they are strong contenders for the team with improved scores including also scoring over 70% in the Team Test at the CDIs in Saumur & Compiègne. Bethany-Rose has worked hard to improve - including thrice weekly gym sessions to build her strength. Rose Hugh Smith & Holsteins Derwisch took 4th place with almost 70% and look to be strong contenders for the final team place. Rose bought Holsteins Derwisch at the Ponyforum Open Sales in Germany in April 2012. British Showjumping have announced the ponies and riders who will represent GB at the Hagen "Future Champions" CSIO in Germany from the 10th to 16th June. 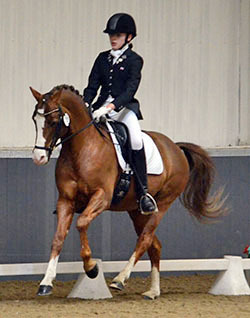 In 2012, 3 of the ponies and riders from the team selected for Hagen were then selected for the Pony Euros team, so a good performance could be key to selection for the 2013 riders too. The Nations Cup takes place on Friday 14th June at 09:45 and the Grand Prix on Sunday 16th June at 09:30. Faye Adams (15) with Some Like it Hot (breeding unknown) and Cisco Bay II (breeding unknown). Alex Gill (15) with Ammanvalley Santino (Cruglwyd Sant x unknown). Results and more information about the show can be found on the Future Champions website - here. Coverage from the show will also be streamed on the ClipMyHorse.TV website. 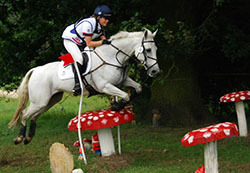 British Eventing have announced a provisional long list of 9 ponies and their riders. The final squad of six (four for the team and two individuals) will be announced after the final trial at Barbury Castle International Horse Trial on the 5th July. 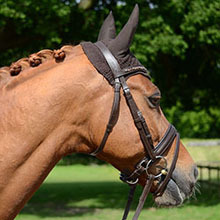 The long list contains some very experienced ponies, albeit some now have different riders. Carrowmore Gemstone won Team & Individual Silver medals in 2012 (with Louisa Nesbitt). Catherston Nutsafe (an Elite graded SPSS mare) won Team Silver in 2008 & 2009 (ridden by Ella McEwen) and Team Gold in 2010. 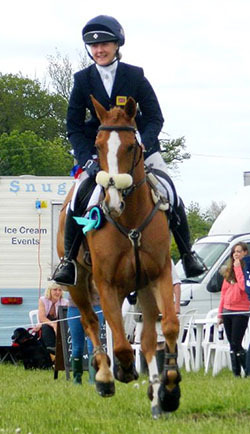 Three Wells Breeze won Team Bronze & Individual Silver in 2011 (ridden by Sam Ecroyd, who had been successful on Catherston Nutsafe in 2010) and Team Silver with her current rider in 2012. Then Craig Mor Tom (in 2012) and Killacoran Blue (in 2011) with their current riders have both represented GB as individuals at the Pony Euros. The second of the Jumping Pony Trials was scheduled to take place at the Bolesworth Classic Show from the 30 May - 3 June. The first day of the show was cancelled as there had been very heavy rain the day and night before and the organisers decided that it was best to give the ground time to dry so that the other 3 days could run. As there wasn't a pony trial class on the first day, this didn't affect the ponies - however, numbers were low for all of the pony classes and both Millie Allen & Amy Inglis only jumped their ponies in the first trial class. The first trial was over a 1m25 first round (1m30 jump off) and attracted 17 entrants. The winners were Christie Pritchard & the 17 year old Irish-bred pony, Cappagh Supreme, and they had a good show overall, as they were also 6th in the second trial class and 2nd in the final one. The second trial was a 1m30 course and run to the "Table A4" rule - so a speed class with placings dependent on time and faults. Eleven combinations competed in this class and Christie Pritchard was the winner again, this time with a different Irish-bred pony, Ruby Riot, who had been 5th in the first class. Emily Ward didn't compete in the first Pony Trial class but made up for it in the remaining two, finishing 2nd with the Dutch-bred pony Wizard VIII and 4th with King Mac in the speed class and then winning the final final class with Wizard. This final trial, the Grand Prix, was over 1m30 in the first round, with the jump off rising to 1m35 and twelve ponies competed. Christie Pritchard & Cappagh Supreme were second and Emma Kitching & Cuffsgrange For Sure were 3rd. Most of the contenders for the dressage team competed at the Compiègne CDI over the weekend 31 May to 2 June. In the team test, 14 year old Phoebe Peters and SL Lucci proved that they are the combination to beat, scoring an impressive 76.41% to win the class by a margin of over 3%. This was Phoebe and Lucci's 10th consecutive win at CDIs in France and the Belgium judge, Freddy Leyman, was so impressed by their performance that he gave them 3 perfect 10s for test movements and Phoebe a 9.5 for her riding. These were the only 10s awarded in the class. Bethany-Rose Horobin and Gigolo showed that their recent form is consistent as they placed 3rd with 70.641% and this makes them strong candidates for the Pony Euros Team. On the second day, in the Individual test, Phoebe and Lucci scored below their norm, getting "only" 71.75%. This still placed them 3rd. Bethany-Rose & Gigolo also scored below par for 12th place but Rebecca Bell & Valido's Sunshine recovered from a poor team test to get 67.68% and place 13th, with Amber Barton & Doctor Little also improving to be just a few marks behind in 16th. In the Freestyle, Phoebe & Lucci were back on top, scoring 77.958% which was over 3% ahead of their nearest rivals. Bethany-Rose and Gigolo were also back on form and scored 71.125% for 4th place. The third British pair to qualify for the Freestyle, Rebecca & Valido's Starlight improved slightly their Individual test score and finished one place higher in 12th. The team will be selected after the compulsory final trial at Wellington Premier League on 9 June. 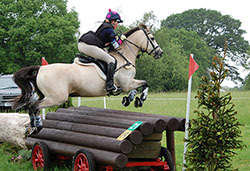 The last of the key selection events for the Eventing ponies was the 2* Charles Owen British Pony Championships at Brand Hall from 31 May to 2 June. The event was run over 3 days with the ponies doing their dressage on the Friday, cross country (XC) on the Saturday, then Show Jumping on the Sunday. The ponies all had to pass an initial "trot up" in front of the Ground Jury and Vet on the Thursday and again on the Sunday morning prior to the Show Jumping phase. On the XC, 24 combinations were clear, but only 6 were also within the time, including the top two after the dressage, so they retained those places. Just 2 time penalties left Rose Nesbit & Carrowmore Gemstone (breeding unknown) in 3rd while just 0.4 of a time penalty lifted Diana Bevan & A Touch of Spice up to 4th place. 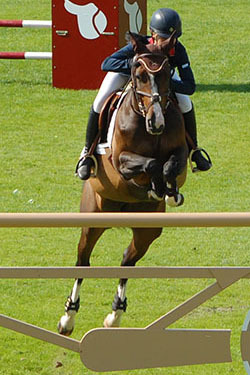 A refusal meant that Lizzie Baugh & Stenigots Red D'Ablo dropped right down the order to 28th place. Being clear within the time lifted Charlotte Bacon & SPSS Elite graded mare Catherston Nutsafe (Catherston Nightsafe x Dutch Courage) up to 5h place and Charlotte Bacon & Three Wells Breeze stayed in 6th place despite picking up a few time penalties. Slightly more time penalities dropped Annie Keir & Castleview Rakish Millie from 4th equal to 7th overnight. Sunday morning started early with the trot up, where unfortunately, Annie Keir's Castleview Rakish Millie failed, followed by the Jumping phase at 9am. As is traditional at a 3DE, competitors went in reverse order of merit and clear rounds within the time were essential for a good final place. Indeed, Thomas Tulloch & Spirit VI (breeding unknown) and Francesca Sargent & The Sky Master (breeding unknown) who were placed 32nd and 33rd after dressage didn't add any penalties to their dressage scores and so finished 5th and 6th. With the next group of ponies to jump (placed 8th to 12th overnight) all having at least one fence down, Charlotte Bacon & Three Wells Breeze had a fence in hand to maintain thier 6th place. A clear within the time guaranteed them this and put pressure on the next 2 riders as they then needed to go clear too. Chelsea Pearce and Catherston Nutsafe coped with this pressure and also went clear but Diana Bevan and A Touch of Spice had an unfortunate 12 faults so dropped form 4th to 7th place. Again needing a clear round to maintain her palce, Rose Nesbitt delivered this with Carrowmore Gemstone, as did Yasmin Ingham & Craig Mor Tom. Overnight leaders, Jamie Thomas & Another Island needed to be clear to win - but, sadly, his score ended up irrelevant as he was eliminated due to Another Island jumping in a double bridle which is illegal under FEI Pony Eventing rules (specifically Annex H Rule 3) and tack at all Pony Trials is governed by the FEI rules. Jamie had had 4 faults, so would have finished 2nd, rather than wining, but it must still have been devastating for him. Thus, Craig Mor Tom & Yasmin Ingham became the 2013 National Pony Champions, a great result for this 16 year old rider from the Isle of Man. 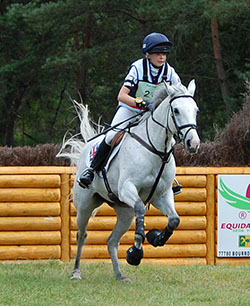 Yasmin and "Tom" competed as individuals at the 2012 Pony European Championships, finishing 36th, and must be top contenders for a team place in 2013. 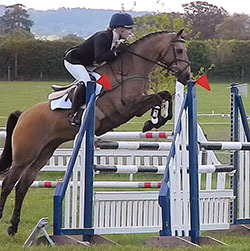 The first of the Viewing Trials for the Jumping Ponies took place at Chepstow International Horse Show, which was held at the David Broome Event Centre (Wales and West) from 4-6 May. There were 3 main Pony Trial classes, one on each day. On the 4th May, 5 of the 35 competing ponies went clear in the Pony Viewing Trial (max height 1.30m). These 5 ponies went forward to the jump off and 3 of them were clear again. The winner with the fastest clear was the 2012 double Pony Euros Gold medallists, Millie Allen & Song Girl (breeding unknown). The next day, in the Pony Trial speed class, the ponies only jumped one round and 7 ponies were clear so the results were determined on their time with the winners being Emily Ward & Dutch-bred Wizard VIII (Okkie Trooi x Sonny Af Hojmark). Emily & Wizard had had 12 faults in the first class but not only did they win the speed class, but they remained fault free in the final class too, finishing 2nd. Emily's other pony, King Mac (breeding unknown), was 4th in the first 2 classes then had a fence down to finish 8th in the Grand Prix. On the final day, the course must have been challenging for the Pony Grand Prix as 11 of the 29 ponies were eliminated, withdrew or retired and another 4 had 12 faults or more. 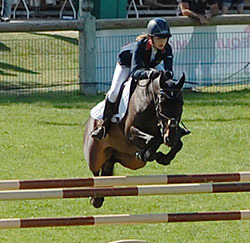 The withdrawals included Beth Adams & Some Like It Hot, who finished 11th overall at the 2012 Pony Euros. However, six ponies jumped clear in the first round, so there was a jump off, and 3 were clear again with winners being Millie Allen with her other pony, Scoubidou. Scoubidou is a part-bred Arab (Krimh ox x Idzard) and he had 8 faults on the first day, then just one fault in the speed class before jumping the double clear to win the Grand Prix. The only combination to feature in the top 6 in each of the viewing trial classes was the 2011 and 2012 Pony Team member, Amy Inglis & Nils D Hurl Vent (Quick Star x Boogie de la Gere) were 9th (with a double clear) in the 1st Trial, 3rd (with a clear) in the 2nd Trial and 6th (clear then 4 faults in the jump off) in the Grand Prix, so they showed the most consistent form of the group. The combination with the most consistent results across the 3 main pony trial classes were Beth Adams & Some Like It Hot (breeding unknown), who impressively jumped clear in each first round and each jump off to finish 8th, 5th and 3rd. One of the oldest ponies competing was the 20 year old Dutch New Forest pony ABC Juri (Valentino x Duke's Forest Oberon) who finished 6th in the Grand Prix ridden by Emma Shingles. 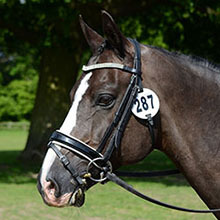 Ridden by Lara Whiteway, ABC Juri was a member of the 5th placed British team at the 2010 Pony European Championships. 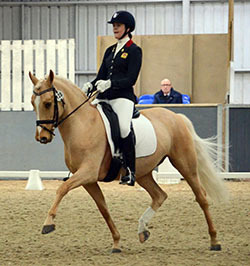 The British Dressage Pony Team Selectors dispatched the main team contenders to two international shows over the weekend of 3-5 May. 6 ponies went over to France for the Saumur CDI, while 3 ponies went to Roosendaal CDI in The Netherlands. The competition was particularly tough at Roosendaal as all the top Dutch ponies were there, along with some of the top Germans. 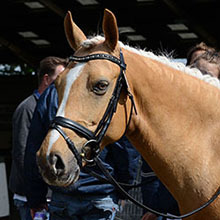 Sadly for Erin Williams, her lovely palomino mare had a badly swollen mouth just before the Individual test that was thought to have been caused by an insect sting and as a result, Erin had to withdraw her from the competition. In Saumur, Phoebe Peters & SL Lucci once again dominated the competition with impressive scores in each of the CDIO Pony Tests. Good performances from the rest of the team meant that GB won the Team Competition ahead of Switzerland & Belgium. In the parallel CDI classes, Rebecca Bell's second pony did well, wining the Team & Individual Tests then placing 2nd in the Freestyle. 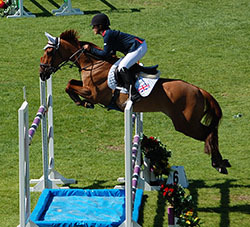 Winners Pumbaa Goess-Saura & Killacoran Blue competed for GB as Individuals at the 2011 Pony European Championships, where they finished in 15th place. Killacoran Blue is a grey 13 year old Irish bred Connemara gelding by Blue Smokey out of Carravilla Rose (by King of the Hills). 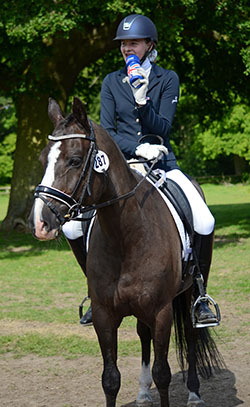 They were listed as 3rd Reserves in 2010 and with his previous rider, Eliza Stoddart, were part of the Silver medal winning team in 2008, finishing 5th individually. Looking at the results from the Pony Trials to date, as well as Pumbaa & Killacoran Blue, other top contenders for places must include Yasmin Ingham & Craig Mor Tom, Diana Bevan & A Touch of Spice, Rose Nesbitt & Carrowmore Gemstone and Libby Seed & Mr Vick. 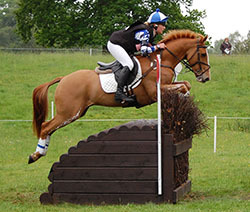 However, the final stage of the selection process is the Brand Hall CCNP2* British Pony Championships on the 1-2 June. In the Nations Cup at the Jumping Pony International in Fontainebleau, France (known as "BIP 2013") on the 20 April, GB, the reining European Champions, made a good start to the 2013 international pony competition season by winning the Nations Cup on a zero penalty score. Germany were the second placed team with a total of 4 penalties then Belgium were third with 8 penalties. The team of four jumped the same track twice and the best 3 scores counted in each round. Three of the British team achieved double clears, a feat only matched by 2 of the remaining 28 competitors, meant that GB lead throughout the competition. The team competed under the "Team Fairfax" banner and Katrina Moore was the Chef d’Equipe. First to go in both rounds was Amy Inglis (16) & Claire Inglis’s Lea Du Genier (Balkh d'Aigremont x unknown) and they were clear in both rounds. 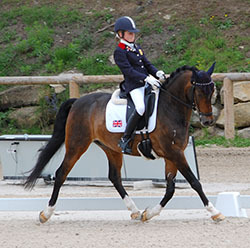 Amy has a regular on Pony Euros teams with Nils d'Hurl'Vent, being members of the 2011 & 2012 Gold medal winning teams. They were also members of the 2010 team and finished 4th in the Individual competition. 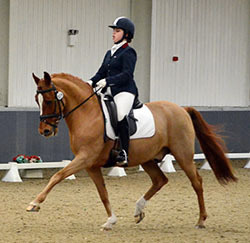 Amy has had recent success with the talented 14 year-old chestnut mare, including winning the Grand Prix at the Pony of the Year Show. Second to go was Faye Adams (14) on Julie Adams’s Some Like it Hot (breeding unknown), a 14 year-old chestnut mare. Ridden at the 2012 Pony Euros by Faye's sister Beth, unfortunately, they had 4 faults in both rounds, so they were the drop score both times. However, many other riders were eliminated or had faults in double figures, so overall, Faye’s performance was respectable. Alex Gill (15) & Lynn Barker’s 9 year-old bay gelding Ammanvalley Santino (Cruglwyd Sant x unknown) also produced a double clear which put the team in a very strong position. Ammanvalley Santino is British-bred by the WPCS Sec D Cruglwyd Sant. Then Emily Ward (13) & Nick Ward's King Mac (breeding unknown) completed the job with another double clear. 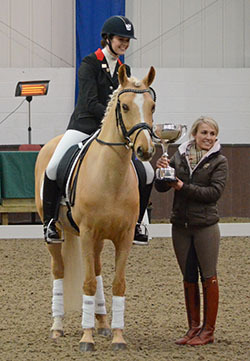 Emily was recently presented with the Sheila Elstone Award at Pony of the Year show. The following day, the two Grand Prix (GP) classes took place. The CDIO GP was a 1.35m class with the CDI GP being slightly lower at 1.30m. In the CDIO Grand Prix, Alex Gill & Ammanvalley Santino had 8 faults on the first round, but the other 4 British riders went clear as did 5 other riders. In the jump off, Emily & King Mac were unfortunately eliminated but Faye Adams & Some Like It Hot were clear and fast for 3rd place then faster still for 2nd were Amy Inglis & Lea Du Genier. However, no one could beat the 2012 winners (and 2012 double European Champions), Millie Allen & Song Girl (breeding unknown), who were a second faster than Amy. In the CDI Grand Prix, Christie Pritchard & the Irish Sport Horse registered Kilcloghan DG Clover (Condios x Clover Hill) were triumphant. In the other classes, Claudia Seara and the British bred WPCS Sec D, Ilar Max (Ilar Sion ap Daniel x Brenin Dafydd) were successful in the CSIP 1m20 classes, winning two and being second in the other. Claudia & has had 11 year old Max for 18 months and they won the 2013 British Showjumping 148cms Special Final at the POYS on the 1st April following 5 wins in Pony Restricted Rider Qualifiers. The pony squad dispatched to the CSI at Zilveren Spoor, Moorsele, Belgium were a mix of experienced and new partnerships and as a result, fortunes varied. In the final pony class of the show, the 1m30 Grand Prix, three experienced British riders took the top 3 slots with 2012 Pony European Champions, Millie Allen & Song Girl (breeding unknown)proving that they are also the ones to beat in 2013 by winning with a fast clear in the jump off. However, her team mate in 2012 (and a team member also in 2011 & 2010), Amy Inglis riding her newer pony, Lea du Genier, who Amy has been competing since November 2012, were fractions of a second behind in second place. 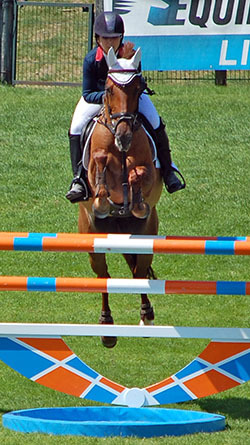 Christy Pritchard & Kilcloghan DG Clover (Condios x Clover Hill) were the final jump off clear round and took 3rd place. In total there were 42 entries in the GP, including three more British riders and all of them finished in the top ten. In 7th place were Emma Shingles & 20 year old ABC Juri (Valentino x Duke's Forest Oberon). 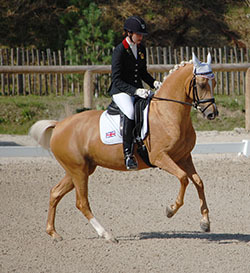 Emma was competing in her first international GP, but ABC Juri has had prior international experience, including being part of the British Team at the 2010 Pony Euros. Fastest of those completing with first round with four faults was Charlie Dawson & Wischin Chin M (Chin Chin x Cash) who finished 8th and then Faye Adams & the experienced (competed at the 2012 Pony Euros with Faye's sister Beth) Some Like It Hot (breeding unknown) were 10th. Millie & Song Girl won Team and Individual Gold at the 2012 Pony European Championships and were also winners of the CSIOP Grand Prix at BIP 2012. Some Like It Hot and Faye's sister Beth were the team reserves for the 2012 Pony Euros, and so competed in the individual Championship, where they finished in 11th place. Amy has been a GB team regular with Nils d'Hurl'Vent being members of the 2011 & 2012 Gold medal winning teams. They were also members of the 2010 team and finished 4th in the Individual competition. The 2013 Pony Teams are sponsored by saddle & girth manufacturer, Fairfax. 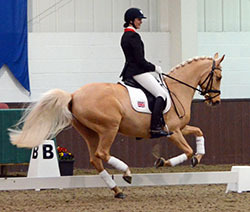 Addington CDI (29-31 March) was the first time in 2013 that all of the top British riders and ponies had competed against each other, with the top 10 combinations being selected to represent GB. The winners in all 3 classes were Nadine Krause (GER) & the established pony, Danilo (Dornik B x Power Boy) and Nadine was also third in both the Team and Individual tests on her second pony, the 7 year old Cyrill WE (FS Champion de Luxe x Power Man). For GB, Erin Williams & Dynasty (Deinhard B x Arts-Dancer-Boy) were second in the Team & Individual tests and 3rd in the Freestyle, scoring over 70% in each test. Phoebe Peters & SL Lucci (Lukas x Bazar) had a difficult start to the competition when SL Lucci fell during the initial vet inspection, then he appeared very sensitive to the slightest noise in the otherwise quiet international arena. However, they improved over the 3 tests to finish 2nd in the Freestyle on over 75%. who recovered from a mishap in the vet inspection to be second in the Kur. 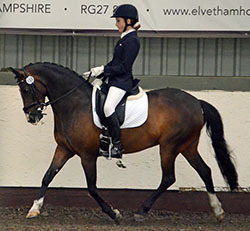 The second of the nominated competitions for dressage selection was the Under 25s Show at Keysoe on March 16th & 17th. Once again, those ponies and riders that had competed at Vidauban for the two weeks were absent and Erin Williams & Dynasty only competed in the Team Test. 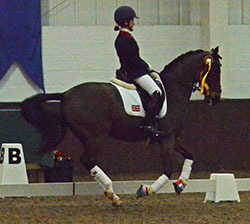 The first of the nominated competitions for dressage selection was the Myerscough Premier League on Sunday March 10th. Poor weather in the lead up to the show and 5 ponies being at the Vidauban CDI resulted in just 7 ponies coming forward for the test. However, with the experienced combination of Erin Williams & Dynasty attending, the quality at the top of the results was still high. 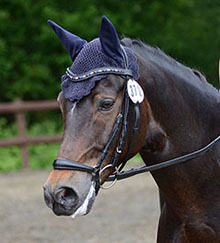 The second placed pony, the 6 year old Der Kleine Lord was competing in his first Pony Team Test. Der Kleine Lord was the 2010 SPSS Young Dressage Pony Champion, so excellent to see the potential spotted at that event following through to good results at a young age at FEI Pony level. Phoebe Peters and SL Lucci maintained their supremacy in the second week of the Vidauban CDI, again winning all three of the Pony Tests. 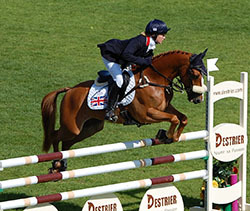 Of the other GB riders, Amber Barton & Doctor Little improved on their first week's scores, while the others did not quite achieve such good scores. However, the weather conditions were poor and affected the going in the arenas. Five of the Pony Squad went out to the CDI in Vidauban, France and Phoebe Peters & SL Lucci made a great start to the season by winning all 3 of the Pony Tests including scoring a massive 80.33% in the Freestyle. Phoebe and Lucci were part of the 2012 Pony Euros team so are experience international competitors whereas team mates Rose Hugh-Smith & Holsteins Derwisch and Ollie Stokes & Carlsson made succesful international debuts with scores in the Team Test along with Isobel Berrington & the experienced GB team pony, DHI Langar. The British Showjumping Pony Team Selectors are led by Claire Whitaker and they hold Viewing Trials to see the pony and rider combinations jumping at different venues. 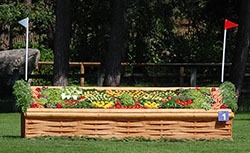 In addition, there are likely to be teams sent to selected Nations Cups, including the 2013 BIP at Fontainbleau. 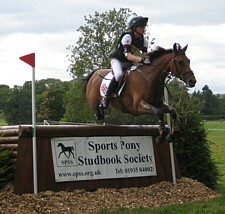 The British Eventing Pony Squad will be selected by Chairman of Pony Selectors Sarah Hancox and her team of selectors. Ponies must be between 142cm (14hh) and 148cm (14.2hh) in height without shoes. As a minimum, ponies are expected to compete in at least one, preferably two, Pony Trials prior to the Withington Manor Pony Trial. If the Selectors feel a combination is ready, they will be invited to enter Withington and the subsequent British Pony Championships at Brand Hall. Invited ponies will be expected to compete at both Withington Manor and Brand Hall in order to be considered for the European Championships. Brand Hall will be the 2013 Final Trial. The British Dressage Pony Squad will be chosen by selectors, Jenny Ward, Sarah Pidgley and John Robinson and announced soon after the 16th June. A key part of the selection process is the performance of ponies in the FEI Team Test, where they are expected to be achieving consistent results at 68% or above. In particular, the selectors expect the ponies to compete at at least two of the following nominated competitions: Mysercough Premier League, Keysoe U25s Show, Addington CDIP and Somerford Park Premier League. They must also compete at the compulsory final trial at Wellington Premier League (6-9 June). Other factors such as age of pony and experience of rider may be taken into account when picking the team, and less experienced combinations that the selectors consider to be demonstrating the potential to score 68% may also be sent to an International competition to give them valuable experience this year.